I love the color orange. For this swap you will create 1 memorydex card for 1 partner with the theme of the color orang. It does not have to be only only, just orange as the main color. It can be holiday themed but does not need to be. This card can be added to our previous color collection of green, purple and black. The card must be 4 inches wide and between 3.25-4 inches tall. Please use a sturdy base of card stock or cardboard, after all we want to collect them, so we want them to last. 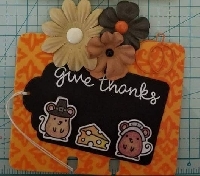 You can use any medium such as collage, mixed media, painting, stamping, etc but NO STICKER SLAPPING. This is senders choice so please do not mark down if you do not like the style, if the card meets the requirements. As always hearts and extra goodies are at your discretion. Please put swap name and your name on back so receiving person can easily leave feedback. And so they have the info to look back on. New to Swab-bot people must have well filled out profile. I will be checking this carefully before assigning partners. U.S only. Don't forget to rate your partner when you receive it. Hey ladies I just updated my address. Sorry Idk who has me but I wanted to let whoever know before you send! Thanks again!